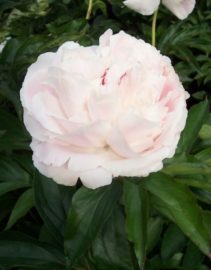 Anybody can learn to hybridize peonies! Ron Boekel "My Gardening Path" on ABC's Gardening Australia. D. L. W. Exact parentage not given, but it is a grandchild of Primevere. Pure white, large, full double: stems strong and tall; foliage; medium sized, dark green. Broad, well rounded petals make a flower of excellent form and beauty. Seedling # 88-55. (Murawska, 1960) (Sarah Bernhardt, Reine Hortense) D.E.M. Pink. Double, true pink, strong stems. Named for a niece of Mr. Murawska. 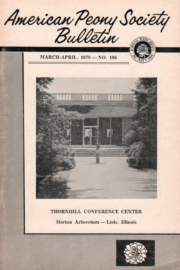 Bulletin 157 June 1960.